CD review: "Back to Love"
This review first appeared in the April 6, 2006 issue of the North County Times. 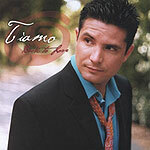 San Diego singer-songwriter Tiamo has classic movie-star looks, perfect hair and sartorial sense to shame most local TV talking heads. And, importantly for someone with a new CD coming out, he's got a pleasant tenor voice. What he doesn't have quite yet, though, is a set of songs strong enough to complement all the above. While several of the 15 tracks here are pleasant enough, there are none that really stand out  nothing to make you want to turn the volume up, or back up and listen again. His writes in a warm, folksy vein somewhere between indie alt-rock and coffeehouse bard, accompanying himself on acoustic guitar and backed by a small combo. Get him some really strong songs with some tight melodic hooks , and Tiamo could be on to something.